A distinctive design with a deep back rest in wood that is twisted almost like a wood aircraft propeller. 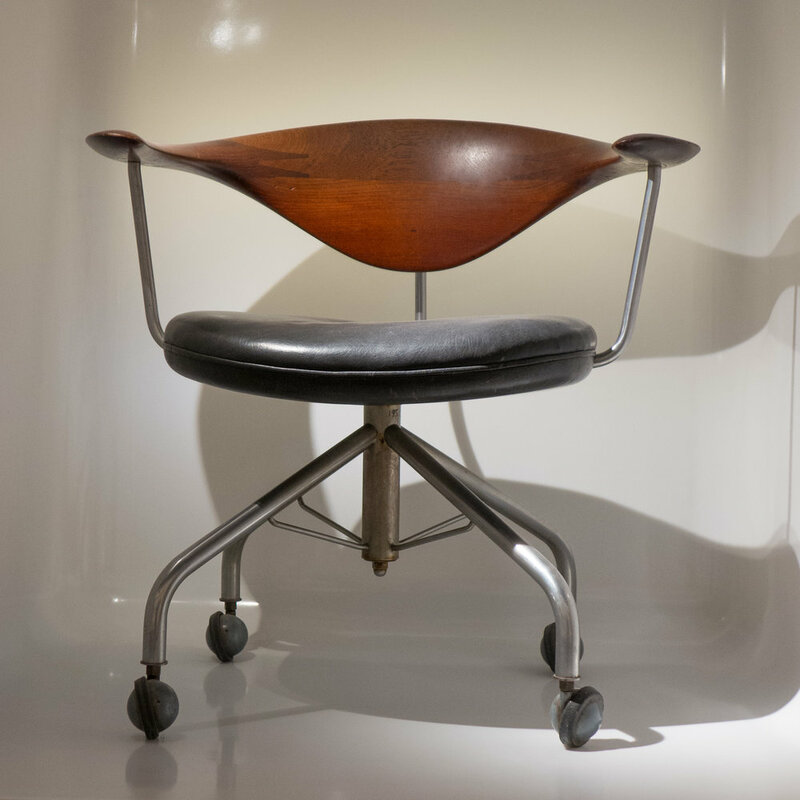 For the shape of the back Wegner was inspired by the work of Doctor Egill Snorrason who had criticised furniture manufacturers because they did not understand how back support was important for good posture although he pointed out that the Cow Horn Chair by Hans Wegner was an exception. The two men met and not only did Wegner subsequently experiment more with the ergonomics of his designs but Snorrason became the Wegners' doctor. Wegner stated that a chair should look good from all sides but that it should also be comfortable as the person moved in the chair and sat in different positions or at slightly different angles. The back rest of the Swivel Chair is deep to support the lower back but there are other features that show that he looked carefully at how people sit and how they move while they are working at a desk. Supports for the back are widely spaced and the supports for the side arm pieces are set out from the seat to allow for as much freedom of movement as possible and the arm rests are actually very short so simply to support the elbows and not restrict movement in reaching across the desk or in writing. If the arms are forward of the body they usually rest on the desk rather than on the arms of the chair … rather different from sitting at a table to eat when most children are taught that it is polite to keep the elbows and arms off the dining table. The base of the chair in stainless steel has height adjustment - again important when desks or tables may vary depending on whether or not there is a desk drawer - and the short arm rests also means that the chair can be drawn up closer to the desk. The castors and swivel mechanism makes it possible to change easily the angle to the desk or to move slightly to reach something. The round seat is padded for comfort … a working day is longer than a meal … and is covered with leather presumably to wear well and for relatively easy cleaning. The complicated shape of the back rest is formed from four pieces of wood with an upper and a lower piece for the deep shaped centre part and serrated or bird mouth joins for the separate pieces of the outer arm rests which are shaped to twist from the vertical face of the back through to the flat spatula shape for supporting the elbows. This is an early form of expensive and exclusive desk chair - sometimes some desk chairs are still described in adverts as an executive desk chair. Even Wegner had to accept that because of the sophisticated design and the complex work needed to complete the chair and the quality of the materials it was expensive for a chair for a secretary and would more probably be used by the boss. 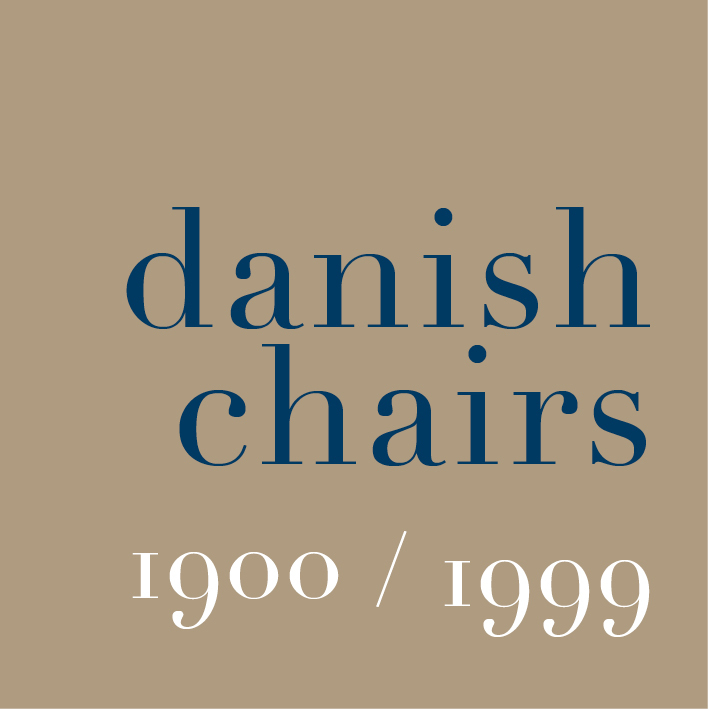 Earlier desk chairs tended to be like a library chair … a more robust and heavier version of a dining chair with arms; Designmuseum Danmark has the chair designed by Kaare Klint and made for the Prime Minister Thorvald Stauning.